High build quality. Good price-point. Built to stand a good beating. If you're not a rock drummer, this kit won't be for you. Built with hard-hitting rock players in mind. the snare has an aggressive woody core that powers backbeats solidly. The toms excel in mid to low tunings where tonal saturation is at its fullest. While Yamaha's pro kits are renowned for their versatility, the new mid-range Rock Tour Series is free of any such ambiguity. From the name itself to its stripped down shell-pack and industrial-cool finish, it's a range that makes a straight play for those wielding a pair of 2Bs. Devised in the wake of the success of 2008's Oak X Custom kit, the Rock Tour Series aims to offer a similar blend of sharp looks and no-nonsense performance but in a more affordable package. 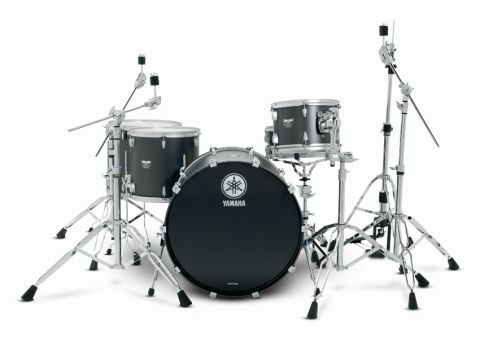 Yamaha is marketing the Rock Tour as a single shell-pack option and has also restricted the number of add-on drums to a minimum. While this makes the Rock Tour Series less comprehensive than other ranges, Yamaha reckons it covers the majority of rock drummers' needs. "The kit ticks all the right boxes - the looks are spot on, the mahogany shells bring their own meaty, powerful sound while the price is reasonable." This largely makes sense, as the single rack tom configuration is, and has been, the choice of innumerable rock drummers, while limiting the options has allowed the quality of the available components to be maximised. Yamaha has a recent history of turning to less ubiquitous woods - the oak in Oak Custom for example - and making great drums. For the Rock Tour series, it has chosen mahogany as the shell material. Mahogany crops up frequently in the history of drum-making, usually in combination with other woods. Though cheaper than other drum staples such as maple and birch, it is a quality wood that is a major component of DW's Classics series shells. Further evidence of mahogany's rock credentials lies in the fact that the body of a Gibson Les Paul, the calling card of pretty much every rock guitarist, is shaped out of a large chunk of mahogany. Mahogany is used in many other areas of manufacturing and is so popular that in some parts of the world it is seriously over harvested. With this in mind, Yamaha has endeavoured to secure an environmentally sound supply of mahogany. All of the mahogany used in Rock Tour drums comes from a re-forested source (so an equal amount of trees are planted as are cut down). The shells are constructed from either 8 or 9 plies, depending on the type of finish. The review kit drums are all 9-ply and a uniform 6mm thick. Internally the shells glow with typical mahogany red-brown hues. The striking Matte Black Metallic finish is one of three new Matte On Matte options which are exclusive to the series. Based around a single colour - in this case black - each finish is reproduced as a matt lacquer that also contains a fine metallic glimmer. The lacquer is opaque (no wood is visible) and the effect is not dissimilar to a wrap finish. This gloss-free vision is further enhanced by a matt coating on the lugs and hoops. Unfortunately the coated hardware doesn't stretch to any of the mounts or the tension rods, but considering the price-point, this is isn't altogether surprising. Eight other, more conventional, finish options are available, all varieties of the Textured Ash lacquers first devised for Yamaha's flagship PHX series. Regular individual colours and sunburst versions are available, with all choices allowing the grain of the wood to flow through below. Textured Ash shells are constructed differently, with the drums being 6-ply mahogany along with two outer plies of ash, making 8-ply shells. Yamaha says this does affect the sound slightly, making the drums a little brighter. Matt hardware doesn't feature with these finishes; instead the drums are supplied with standard chrome-plated lugs and hoops. The shellpack Yamaha has settled on is a combination of a 22"x18" bass drum, 12"x8" rack tom and 16"x15" floor tom. The add-on drums available are a 14"x13" floor tom (seen here with this kit) and 10"x7" and 13"x9" rack toms. A solitary 14"x6" snare drum - included here but available separately as well - completes the range. Though mahogany is a fully-fledged hardwood it's not quite as dense as some woods used in drums; as a result the individual drums are pleasantly manageable when it comes to loading up. Such comparable lightness makes for resonant shells though, and the relatively high ply count combines with this, giving the drums impressive levels of clarity and projection. The bass drum punched out deep slabs of low frequencies. With no dampening inside, the drum had a warm, open air but at the same time possessed a natural decay that kept it well clear of rumbling territory. So with a standard set of heads and minimal tuning, the kick produced a quality of sound that far more expensive drums would be proud of. A friend who is both a talented drummer and sound engineer listened and declared that it sounded perfect. It was hard to disagree with him. With hard-hitters in mind, the toms come furnished with Pinstripes. As would be expected, the twin-ply heads increase the levels of depth and attack on offer. Like the bass drum, the toms seem primed to excel in mid to lower tunings, where the tonal saturation is at its fullest. Here they responded with a meaty bark that decayed quickly, no doubt aided by the head choice. They were pretty darn loud too - a fill across the toms resulted in a series of fat detonations that would puncture most backlines with ease. Playing the toms lightly didn't elicit the same powerful response. To get them into the zone they appear to require some elbow grease - not a problem for the target player, we imagine. The snare was happiest in mid to high tunings where its crisp, sharp response met the other drums on equal terms. Tonally it was fairly bright, but had an aggressive, woody core that powered backbeats solidly while fills were snapped out with zeal. The vibrant and energetic feel of the snare extended to the quieter end of its dynamic scale, where it revealed excellent sensitivity. It also held its tuning well, in part due surely to its 20 individual lugs - another stamp of quality not always found at this price level. It's unusual for a manufacturer to design a range around a single genre, but with rock's dominance of the mainstream, Yamaha's inspiration is obvious. The resulting kit ticks all the right boxes - the looks are spot on, the mahogany shells bring their own sound (and a meaty, powerful sound it is) while the price remains thoroughly reasonable. Yamaha's reputation for quality is evident all over the kit, from the general feel and finish of the drums to the small details.